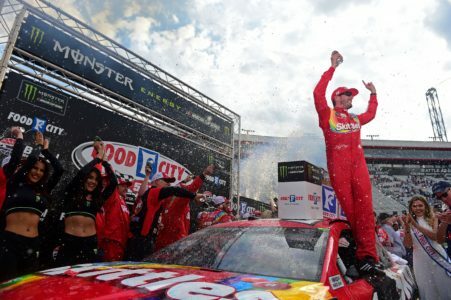 Starting from 17th place Car 18 Kyle Busch Skittles Toyota won the 59th Annual Food City 500, his 54th win in 506 Monster Energy NASCAR Cup Series races. 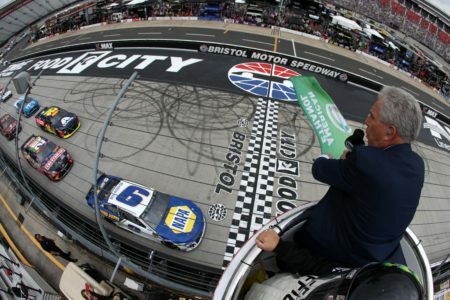 This is his 3rd win & 8th Top 10 finish in This is his 8th win & 16th Top 10 finish in 28 races at Bristol Motor Speedway. 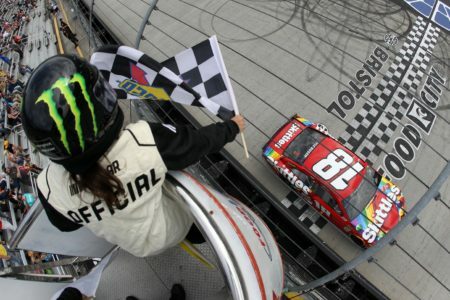 Both Busch admitted they would have crashed their brother for the win if needed, which was not needed as Kyle won with a Margin of Victory: .722 Seconds. 2nd Place Car 1 Kurt Busch Monster Energy Chevrolet, started from 27th place posted his 19th Top 10 finish in 37 races at Bristol Motor Speedway. It is his 6th Top 10 finish in 2019. 3rd Place Car 22 Joey Logano Autotrader Ford, started from 7th place posted his 10th Top 10 finish in 21 races at Bristol Motor Speedway. 4th Place Car 12 Ryan Blaney PPG Ford, started from 3rd place followed by 5th place Car 11 Denny Hamlin FedEx Freight Toyota, started from 5th place. 6th Place Car 21 Paul Menard Menards/Sylvania Ford, started from 9th place followed by 7th place Car 14 Clint Bowyer Haas Automation Ford, started from 8th place. 8th Place Car 41 Daniel Suarez Haas Automation Ford, started from 20th place followed by 9th place Car 6 Ryan Newman Wyndham Rewards Ford, started from 11th place. Lastly in the Top 10 was Car 48 Jimmie Johnson Ally Chevrolet, 10th place, started from 10th place. Ryan Preece (25th) was the highest finishing rookie. Kyle Busch leads the point standings by 27 points over Denny Hamlin. The race had 5 Cautions for 32 Laps: 1st Caution on lap 3 for #10, 17, 18, 24, 47 Crash on the backstretch. 2nd Caution on lap 39 for #9, 32, 47 Crash on the frontstretch. 3rd Caution on lap 119 for #8 and 15 Crash in Turn 1. 4th Caution on lap 127 for Stage 1 Conclusion. 5th Caution on lap 214 for #9 and 36 Crash on the frontstretch. 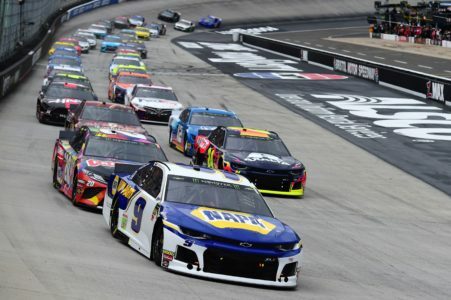 The race had 21 Lead Changes among 9 drivers; C. Elliott 1-38; C. Bowyer 39-40; R. Blaney 41; D. Hamlin 42-48; E. Jones 49-58; R. Blaney 59-117; C. Bowyer 118-123; T. Dillon 124-129; B. Keselowski 130-144; J. Logano 145-255; R. Blaney 256-353; J. Logano 354-374; C. Bowyer 375-377; J. Logano 378; C. Bowyer 379-383; K. Busch 384-408; C. Bowyer 409-416; J. Logano 417; K. Busch 418-444; B. Keselowski 445-469; J. Logano 470-481; K. Busch 482-500. Race Comments: Prior to the start of the race, the following cars dropped to the rear of the field under penalty for the reasons indicated: #47 (backup car) and #4 (multiple inspection failures). Failed to Qualify: None. Time of Race: 2 Hrs, 56 Mins, 38 Secs. Average Speed: 90.527 MPH. Margin of Victory: .722 Seconds. Caution Flags: 11 for 77 laps; Laps. Lead Changes: 21 among 9 drivers.